Yellow Gold and White Gold meet in this high quality design 14k two-tone gold Christian Ichthus heart ring, from Apples of Gold Jewelry. The ring is made in 14k yellow gold with the Ichthus symbol in 14k white gold. 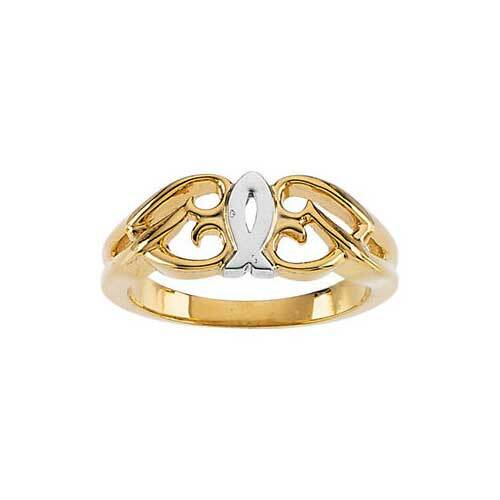 Two swirly hearts in yellow gold adorn on the ring on each side. Available in women's size 4 - 9, including 1/2 sizes, the ichthus ring for women weighs approx. 4.28 grams of 14k solid gold. The ichthus symbol was a secret, underground church historic Christian symbol used by early Christians who were being persecuted. Also available in sterling silver, shown below, or all white gold (by request). "Then shall they deliver you up to be afflicted, and shall kill you: and ye shall be hated of all nations for my name's sake" (Matthew 24:9). We guarantee our 14K Two-Tone Gold Ichthus Heart Ring to be high quality, authentic jewelry, as described above.